UPGRADE TO First Class in the New York Central Private Pullman Car "Cold Harbor"
interior features comfortable seating 16 in easy chair seats, couches, and dining room chairs. Your own Car Steward will be onboard for extra service. An opportunity at living the elegance and class once enjoyed only by the Railroad Barons in the past. 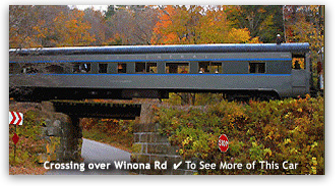 UPGRADE TO Presidents Class in the Bangor & Aroostook Parlor Car "Determination"
This Pullman Car is climate controlled Presidents Class Service includes some special snacks, treats and beverages enroute served by your own car steward onboard. An opportunity at living the elegance and class once enjoyed only by the Railroad Barons in the past. A full compliment of images of this car are available Here. 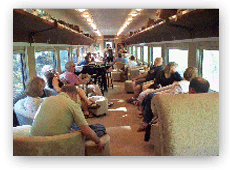 Presidents Class is $115.95 per person. 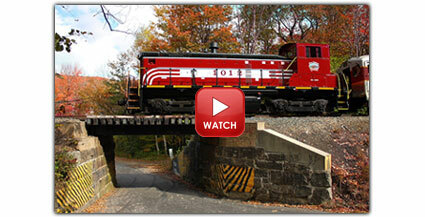 Dont wait as these two Pullman cars sell out early - Purchase tickets Online For info 603-745-2135. PLEASE NOTE! 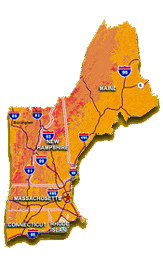 Call our Main Office at (603) 745-2135 located in scenic Lincoln NH. for additional information or for reservations for either location.